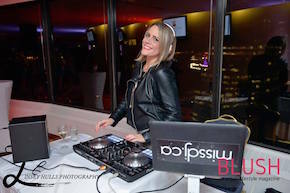 When it comes to DJs, Chelsea Joelle is as talented as she is experienced, engaged as she is professional. Versatility, a deep musical knowledge, and the intuitive ability to read a crowd is what sets her apart. Her styles range from top 40, house, urban, remixes, disco/nu-disco, lounge, world beat, or whatever the flavour may be. She is able to tailor her sound and style to any venue or event, effortlessly. Since 2005, this Canadian-born talent has been spinning locally as well as internationally. Singapore, Malaysia, Thailand, Bali, Mexico, and the US are some of the major locales she has played in. Her international break happened in 2007, as one of the first North American female DJs to appear in the Orient. She toured throughout South East Asia and graced the decks at notable venues such as Zouk, Traders Hotel and the Mandarin Oriental. 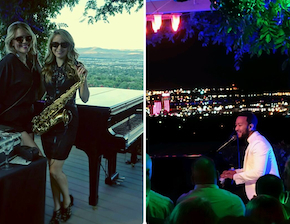 Locally, she has played for hundreds of different events and venues, ranging from fashion shows, launches, corporate parties, retail, restaurants, and weddings. Feature DJs for high profile clients, outdoor events, and exclusive parties. Her crowning achievement was performing alongside Leona Lewis at the MTV Asia Awards 2008. She's appeared in many print, TV, and radio spots - gracing the cover of TimeOut KL, Junk Magazine, Star Newspaper, The Beat Magazine Bali, an hour special about female DJ's on Malaysian television, as a guest host on "Turn It Up" radio, and the list goes on! Chelsea and her brand MISS DJ continues to trailblaze as a tastemaker, DJ and music stylist in some of the hottest spots in the city. Chelsea is also available to perform with live musicians including a guitarist, a saxophonist, a percussionist or a vocalist. She is available to appear specifically with JTEG’s own Karla Sax or guitarist Mike Machado.